As leaders of innovation who guide their businesses through consistent change, Chief Information Officers constantly look forward, to define new processes, evaluate new tools, and plan new strategies. Not just at the end of one calendar year, or the beginning of the next. However, this time is generally ideal for assessing the results of the past and mapping out the road ahead based on lessons learned. Gartner data shared at the recent ITxpo Symposium in Orlando demonstrated that digital initiatives and growth are the top two CIO mandates for 2019. 2019 promises to be a year of both priority shifts and increased focus in information management and governance. The role of the corporate CIO and the ways technology is perceived and budgeted for in enterprises is also changing. Whether you are a newly-minted CIO or a seasoned veteran, you’ll find some compelling insights here to help you define your strategy for 2019, and beyond. Structured and unstructured content and data are created at unprecedented rates every day, then uploaded to the cloud, and downloaded many times over. The patience for latency in the delivery of digital content, including streaming video, audio, and text is minimal – across all devices and by corporate employees, customers and other stakeholders. Providing your employees, guests, customers and/or contractors with managed and guest Wifi access drives employee productivity and customer satisfaction. Modern business applications, connected smart devices, and streaming media have insatiable appetites for bandwidth. Optical fiber offers the stability and scalability which your employees demand and your guests will appreciate. For public sector institutions such as health care providers, government offices and schools, next-generation metro Ethernet services meet the security compliance standards without sacrificing reliability or speed. Gathering data on climate conditions, air quality or water purity requires strategic placement of sensors, often in places where broadband cabling isn’t realistic. Cellular transmission of soil moisture data, for example, is a common practice in agriculture where the data volume throughput is low, but the value of the crops in a defined area is very high. Transporting, encrypting, storing and analyzing IoT data, whether devices are collecting data through sensors or delivering data through an ATM machine demands the utmost in reliability, security, and availability. Gartner’s CIO priorities study found that 17% of CIOs planned to increase their investment in services and infrastructure for the IoT in 2019, compared to 15% of IT leaders who planned to increase their investment in data centers and network infrastructure. Other “things” include security cameras, indoor climate controls, RFID sensors and wearables like ID badges. Speaking at the Gartner Symposium, Gartner’s distinguished VP Andy Rowsell-Jones said 95% of the CIOs they spoke to in a recent survey expect cyberthreats to get worse in 2019. 40% of those surveyed plan to spend more on data security compared to 9% who plan to spend more on Wifi and wired internet access, and 10% on networking appliances and voice/data communications. The study showed that CIOs generally had confidence in their teams that safeguard their data, but “more is more” as it relates to implementing security technology. As data privacy standards like the GDPR are being enacted around the globe, CIOs and their CISO and CPO counterparts need to be ever-vigilant about meeting regulatory standards to avoid fines and reputational damage. Some of these new responsibilities and strategies may surprise you, though in 2019, don’t be too surprised if they cross your desk. The good news is, in 2017, about 60% of LOB professionals surveyed said their company’s CIO was a trusted advisor or strategic consultant within their organization, and 20 percent said that executive was a rogue actor or a roadblock to innovation. In 2018, 80% of CIOs are seen as advisors and consultants, and only 10 percent as rogues or roadblocks. A Forbes article names cloud initiatives as a top three digital mandate for CIOs in 2019. Different workloads and business use cases are uniquely suited to different cloud categories. So it’s no longer about whether a business should choose public or private cloud, it is how CIOs and their teams should adopt connected cloud platforms, and ensure their “multicloud” environments are designed, deployed and integrated to fit evolving business needs. CIO.com’s research from their State of the CIO webinar found that cybersecurity, leading digital business initiatives and revenue growth through digital were the top three objectives for 2019, at about 35% of CIOs surveyed. 80 percent of CIOs said they planned on having broad integration across cloud applications and other aspects of their technology ecosystem within the next three years. A key takeaway from the CIO.com study is that CIOs should offload non-strategic IT management to managed service providers and cloud vendors. As the volume and variety of data grows within an organization, and within public and partner repositories of data, it has access to, the importance of understanding the trends and insights within that data grows. The adoption of business intelligence applications for predictive analytics and the implementation of smart applications which can apply contextual filters to data will continue to be a big play in 2019. Many of the applications of AI and machine learning in industries like healthcare and government still seem like they were born out of science fiction, though they are rapidly becoming business fact. Though the expertise of your employees has great value, automation of high-volume, low-complexity tasks through process automation helps them to focus on high-value business and delivering more value to customers. The “State of the CIO” webinar replay discusses how CIOs should add their company’s CFO, CMO, and CSO to their lunch invitation list. 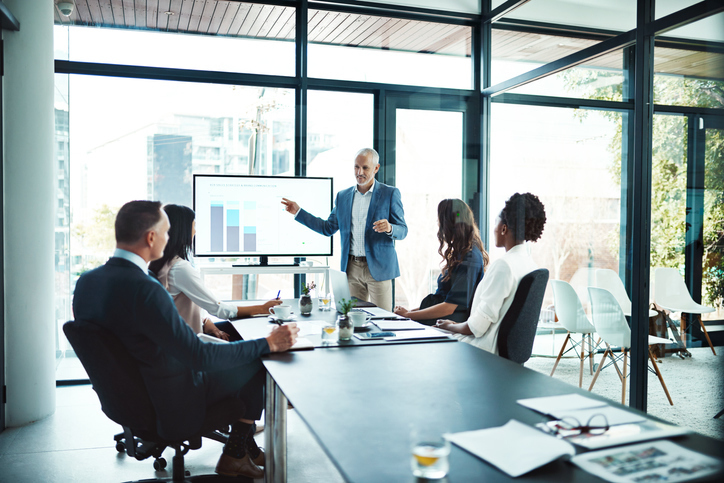 As budgets are shared between different departments, and “pain chains” connect multiple stakeholders, CIOs can get more support for their digital initiatives and growth objectives by teaming with their counterparts in the C-suite. What are your company’s key business technology and communications mandates for 2019? Do they map to the survey results included in this article, or are there other more pressing needs? Contact your Cox Business account manager or visit us at coxbusiness.com.